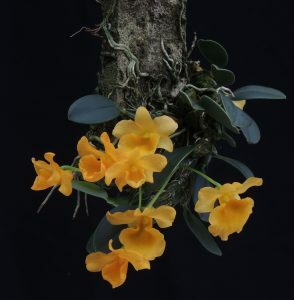 This is a delightful small growing species from the Eastern Himalayas and South East Asia. The species is well suited to growing mounted as its bulbs hug the surface of the cork. Flowers are produced at in late spring from last years growths in ones and twos and each year as the plant grows the number of flowers increases. We find that this is a species that likes to be moved for the winter. Its altitudinal range from 750 to 1500m indicates that it likes a warm summer but a cooler winter and so it spends the summer in Warm Asia and then moves to the roof of Cool Americas for a dry winter rest. This year the flower spikes emerged in March and at that point we moved the plant back to Warm Asia but continued to keep the plant dry until the flowers opened late last week.